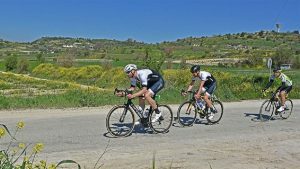 Chris Breckon has been a firm fixture on many Sports Tours International cycling events as a bike hosts and representative over the last 5 years. Chris also takes part in a lot of overseas cycling events when he isn’t working for us and among others he has done many of the Haute Route events including the Alps, Dolomites, Pyrenees and Mexico. 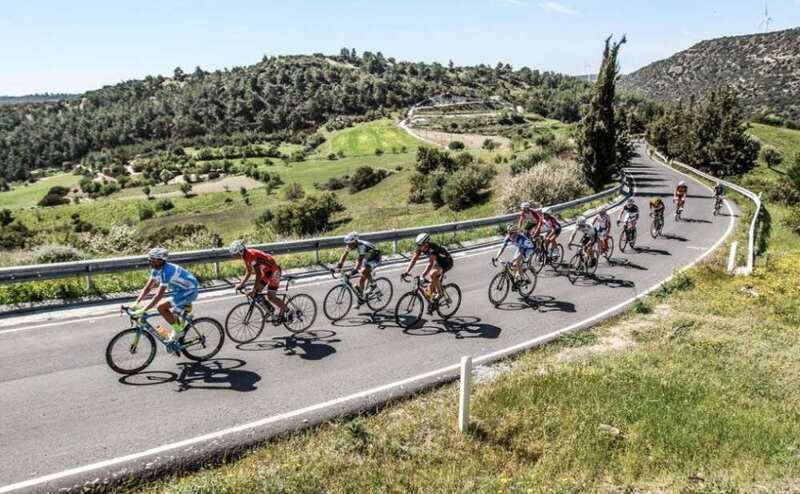 Chris went to take part in the 2019 Gran Fondo Cyprus. 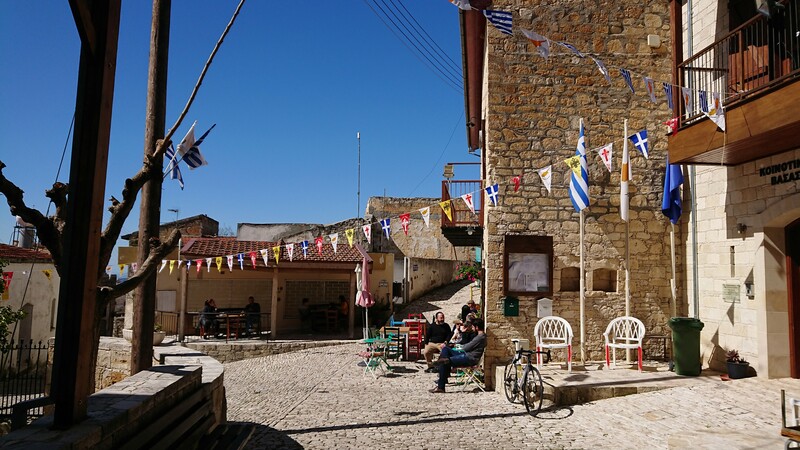 Cyprus is obviously a very well-known holiday location in the UK but it’s possibly less well-known for its fantastic cycling. Whenever you see a list of popular warm weather cycling destinations, you tend to see the likes of Tenerife, Mallorca and the Costa Blanc mentioned more prominently. 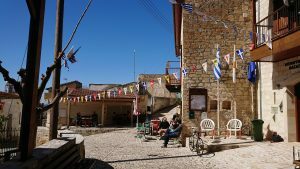 Cyprus is a great alternative with the many direct flight links, big choice of hotels and of course it’s well-suited for UK riders due to its left-side roads and roundabouts, and English speaking residents. 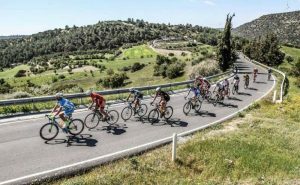 The Gran Fondo Cyprus is a well-established event that has been running for many years and continues to grow and attract cyclists from all over the world. 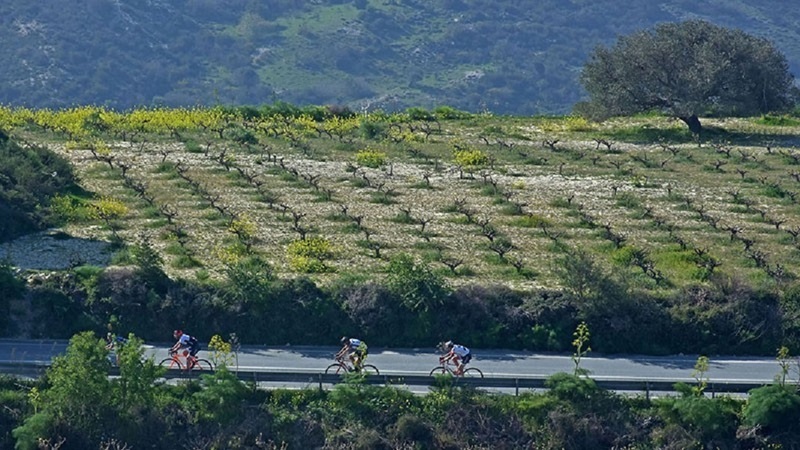 With its position in the eastern Mediterranean, the event attracts many riders from Russia, Israel, and Ukraine. It had an international feel that was different to the Gran Fondo events in France and Italy. 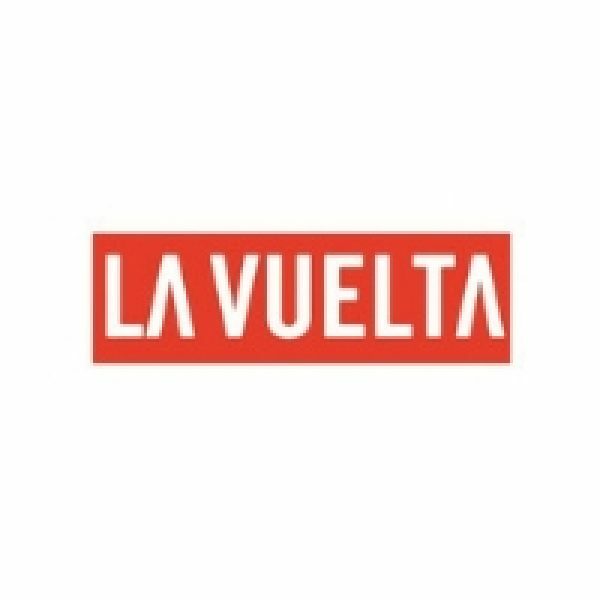 You will feel that you are riding elbow to elbow with a big international field of riders giving a very unique mix of cultures and languages. 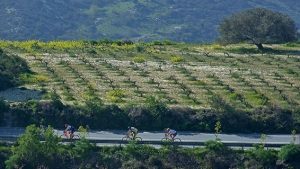 The timing of the Gran Fondo Cyprus at the end of March is again well suited for UK riders as there is enough training time to build up fitness coming out of winter. 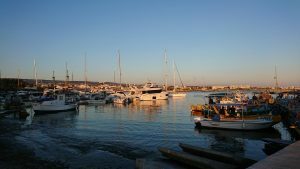 The weather is usually warm with plenty of sunshine (although read more later on this!) 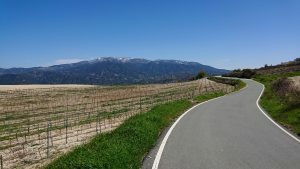 and the roads inland are quiet of traffic and just starting to show spring-time growth and colours. 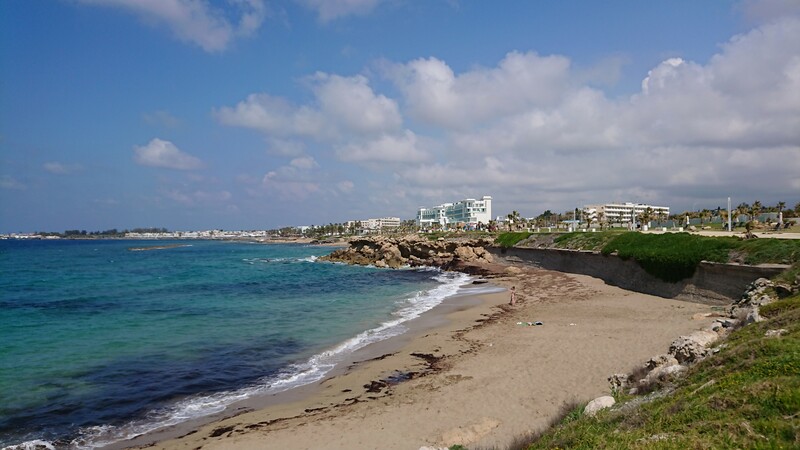 Paphos is an ideal base for a few days or even longer, with a good amount of shops and restaurants, supermarkets for the food and drink top ups, a natural swimming bay and a few nice sandy beaches dotted along the 5km long promenade. It’s the sort of town where even non-cyclists would be happy to spend time so no need to worry about being a “cycling event widow” on this trip! 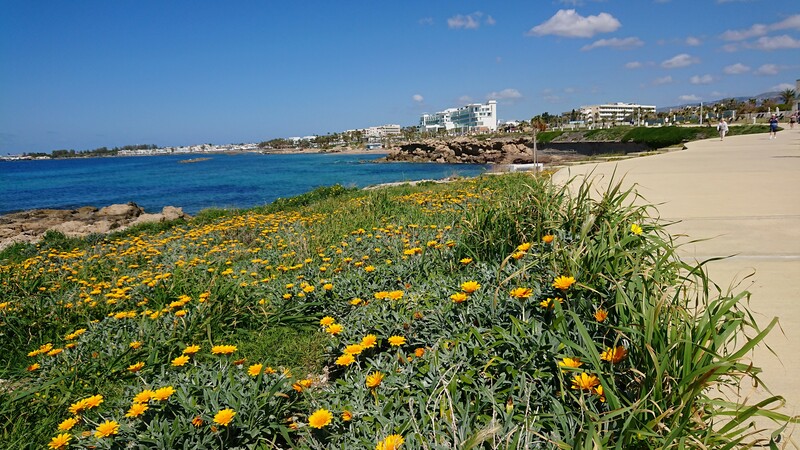 The standard of hotels in Kato Paphos is very good, with most being located directly off the seafront promenade and offering top class facilities. 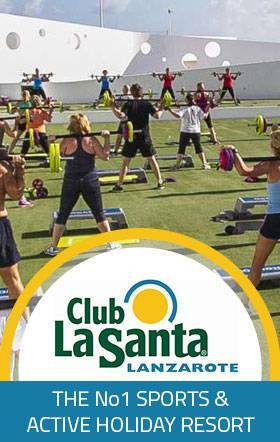 A friend who was staying at one of the hotels with his family commented that he was having trouble resisting the fantastic food that was offered, he was expecting to lose weight over the 3 day event not put it on! 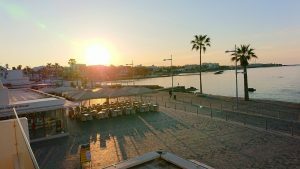 The registration for the event was done at the spectacular 5 star Olympic Lagoon hotel. 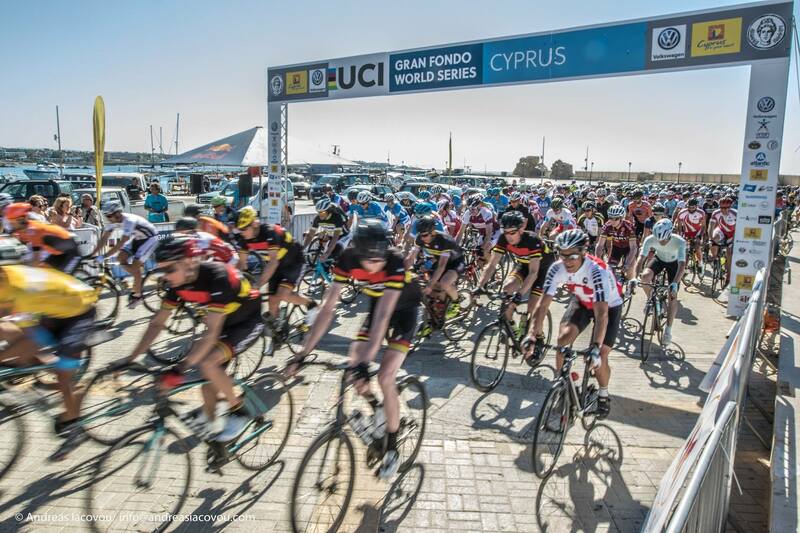 A 10 minute walk along the seafront from Kato Paphos but for many riders it was their base for the event and the hotel was happy to provide all services required by a crowd of international cyclists. 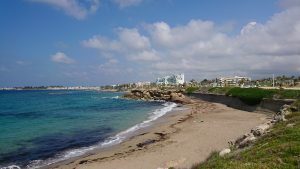 I was lucky enough to fly out to Paphos the weekend before the event, so I could reconnoitre the course and investigate the area before the event build up. 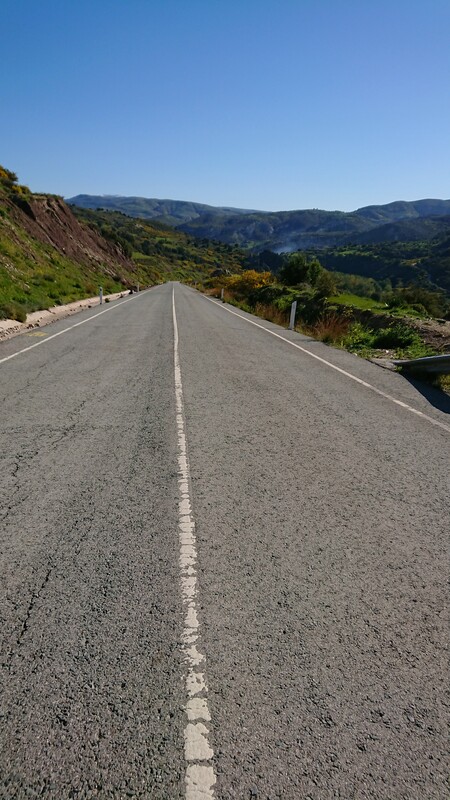 This meant I was also lucky enough to have five days of blue sky and sun as unfortunately on Day 1 of the Gran Fondo Cyprus the skies clouded over and the torrential rain came down! Undeterred the riders lined up in their rain capes and set off as planned. The lesson here is not to forget this is an island in the Mediterranean, so although the weather is usually perfect it is a wise move to pack some rain gear in the kit just in case, its always better to bring kit and not use it than it is to have to ride in inadequate clothing and suffer as a result! 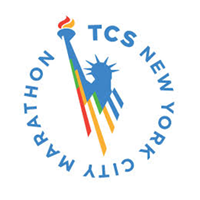 The event is divided into two groups, the Expert group, for those who are experienced racers or feel fit enough to ride with a high sustained effort, and the Sportive group who are not so concerned with keeping up with the head of the race, or would rather ride at their own pace or with friends in a group. 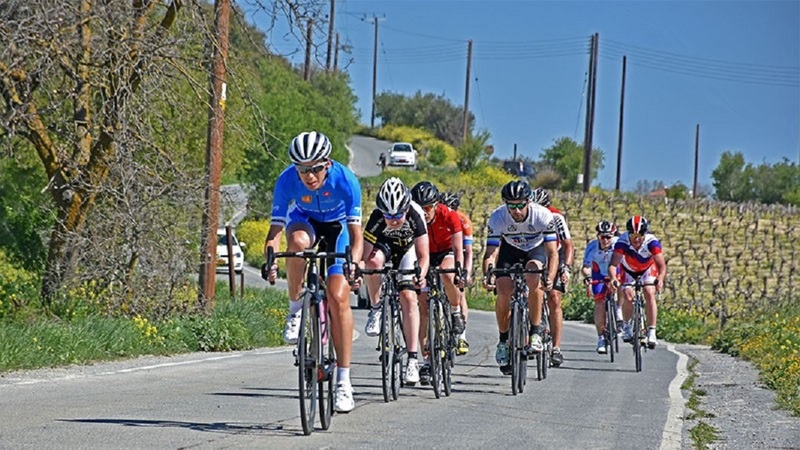 For the Sportive group Day 1 was a mass start at Paphos Castle on the waterfront and a 96Km out-and-back route on mainly rolling roads along the coast and then some decent climbs that produce a considerable 1500m elevation and ended with a finish line and refreshment area at Kouklia. 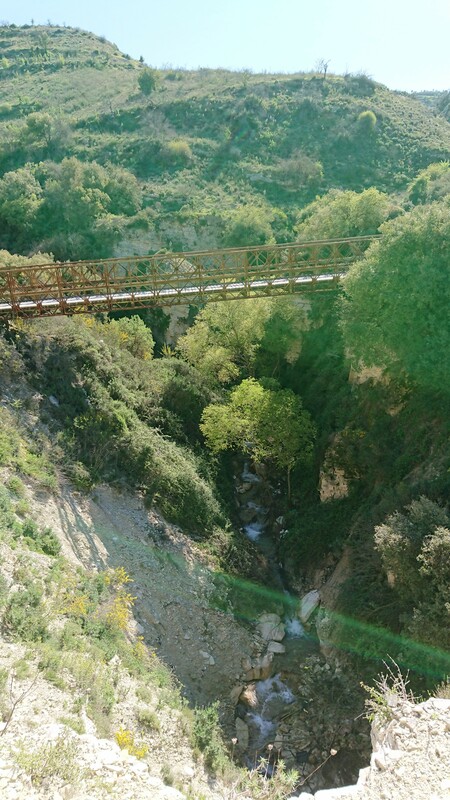 A fine introduction to the roads of Cyprus or a leg stretcher for the following days in the hills. 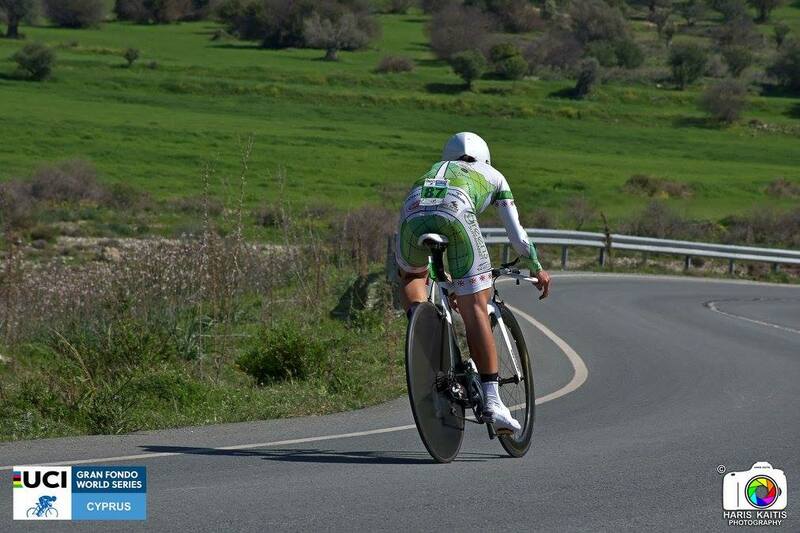 The Expert group have their individual Time Trial on Day 1 and the riders have to get themselves to the start area which is about 15km away from Paphos, and easy ride that takes about 45minutes, or I saw many choosing to rent their own transport to the start area. 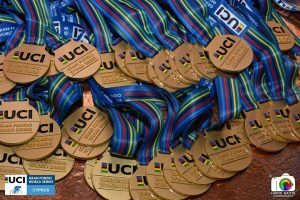 The ITT is a qualifier for the Time Trial at the UCI Age Group World Championships so the standard is very high, with a lot of the riders bringing specific TT bikes and aero kit for the event. 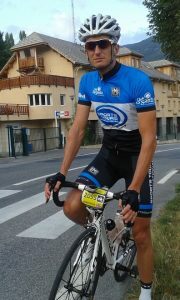 Skinsuits and deep section wheels were a common sight on the start line. 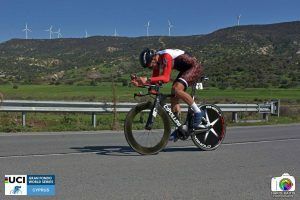 The 28.6km ITT route was an out-and-back with 357m of climbing, mostly going up for the first 14km before making the turn and enjoying the mostly downhill return stretch. 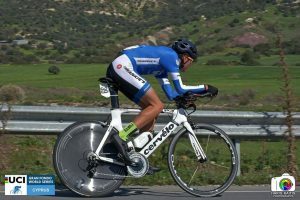 Despite the rainy and windy conditions on the day the top riders were achieving average speeds for the course of over 42kmh and the winning time was 37minutes -so the standard is a high one. 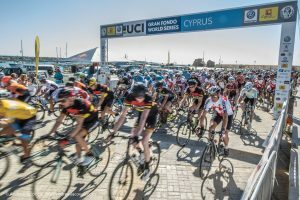 Day 2 was a 96km and 1600m of climbing, and began with a mass start for both Expert and Sportive groups at Paphos Castle right on the waterfront. With a 9.30am start it was welcome to have more time in the mornings than you often get with other GF events! A 15km neutralised roll out through along the coast road caused the usual elbow-nudging, wheel-watching, and gap-squeezing that usually happens when following a pace car. 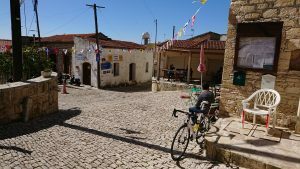 Once released on to the timed section it was a great route taking in sustained effort climbing, technical uphill gravel section, fast descents, hairpins, smooth cobbles through the village of Vasa, and a 7% final 500m sprint to the line at Kouklia just in case there was anything left in the legs. 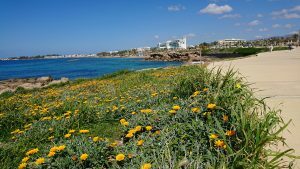 From the finish area it is again an easy 15km spin back to Paphos, ideal as a warm down to prepare ready for the following day. 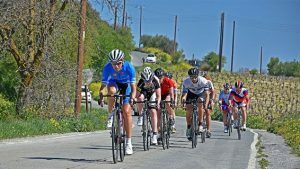 Day 3 started the same with the location at Paphos Castle providing a great visual sight and a memorable start line, and again after the same neutralised 14km roll out through the town we were released on to the timed section as a flying mass of final-day energetics and UCI qualification chasing! 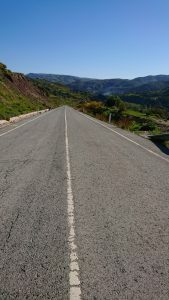 The route for Day 3 was identical for both Expert and Sportive riders, once the timing began it was 54km with 1435m elevation, with the first 30km being an uphill slog with the occasional downhill dips giving just enough time to take a drink or a gel before the road rises again and the group thins out into rider following rider and trying to hang on to the wheel in front. 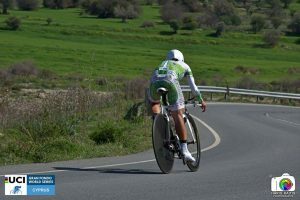 After almost 30km of uphill drag a long downhill and valley section allows the chance for the expert descenders to catch back on or to make a break off the front, before the final 10km to the finish line at Tsada is again mostly uphill and will test any legs that still have any energy left to give. 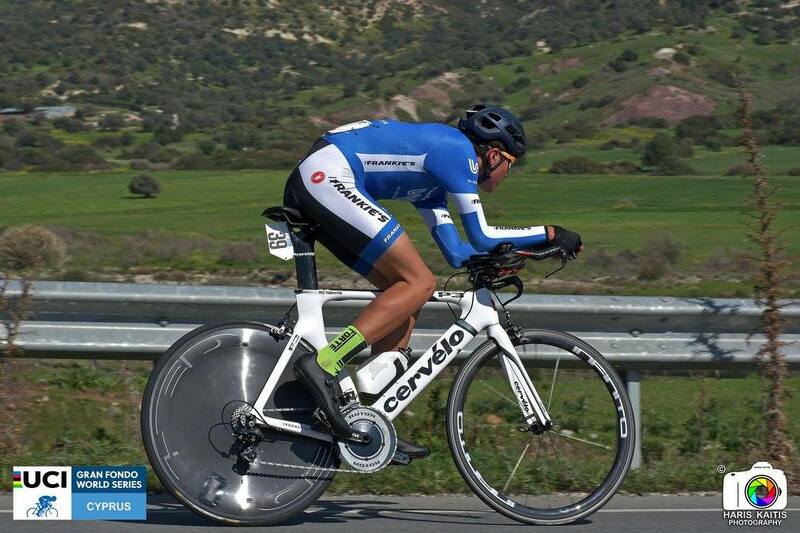 With the slightly earlier start time and the shorter route it meant we were able to finish at around 12pm, so after a nice 10km downhill run back to Paphos there was time to pack the bike and do any recovery before the 3pm Medal and Closing ceremony at Paphos Castle. With free food and drink on offer this was very well-attended again despite the grey skies and cool breeze on the waterfront, and it was a great way to conclude the 3 day event. 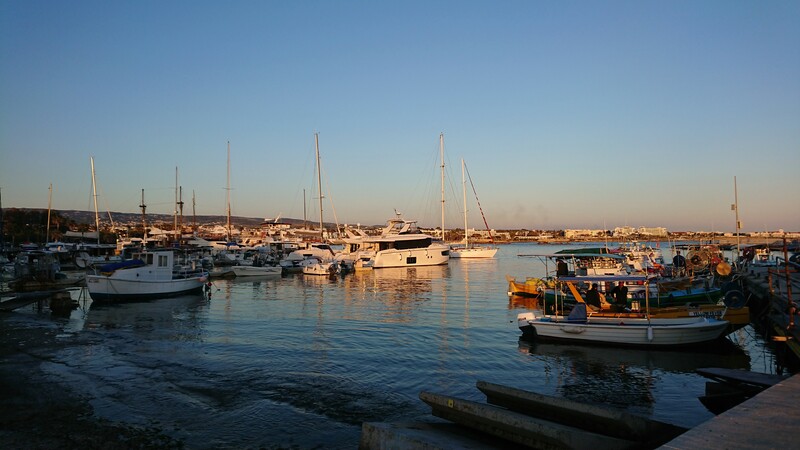 For the riders on a tight schedule it would have been possible to be on a return flight by 6pm or thereafter on the Sunday, although most riders chose to stay on for one final evening in Cyprus and to celebrate and relax in style after a great few days in Paphos. 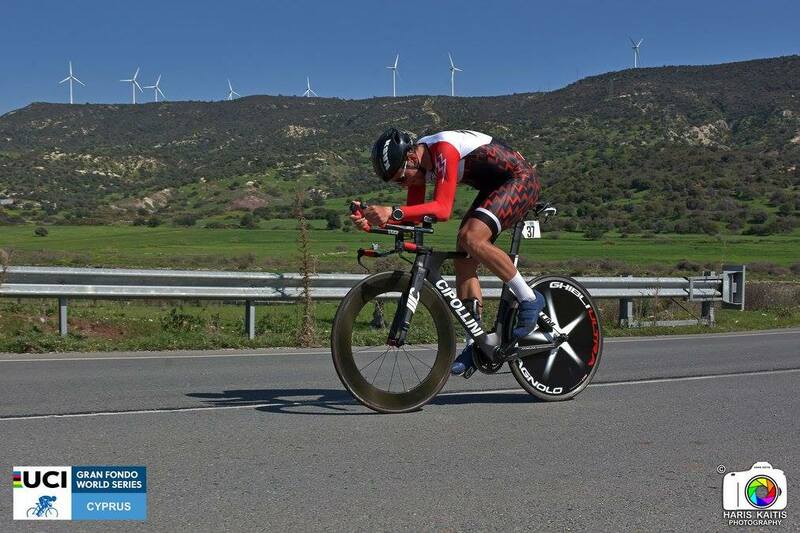 It was my first time riding the GF Cyprus but I will be back next year for sure, thanks to the organisers and the support staff for running such a great event and with creating a really challenging and memorable route, if you are looking for an early season target or a perfect way to kick off the year of cycling achievements then the GF Cyprus is highly recommended, and I look forward to doing it all again next year!